Project Description: Customize your own cards with Grafix products. 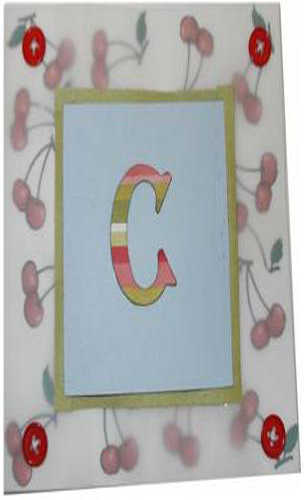 Create Cherry Rub On decals using clip art. Here we have used clip art from Microsoft.com. Print onto the Rub-Onz Film according to the directions on the package. Cut white card stock to 10”x5” and fold in half to create a 5”x5” card. Apply the rub on decals to the front of the card, following the directions inside the package. Cut the green card stock to 3.25”x3.25” and the blue card stock to 3”x 3” and layer together using Double Tack. Cover a 2”x 2” square of Chipboard with striped paper and die cut the letter of your choice. Secure using Double Tack to the center of the card stock squares. Cut a square of vellum to 5”x 5” and secure to the decorated cards face with a small square of Double Tack placed just in the center of the vellum. Secure the card stock to the center of the card and vellum with Double Tack. Sew a button onto each of the 4 corners.